As we work to get caught up on a heap of recent travels, this post takes us back to March and a trip from Florida back to New Jersey. Along with brother Bruce, I flew down to Orlando to pick up a car to drive home. Our goal was short lines along the way, but with the first two days of the trip occurring on a weekend, short line activity was minimal. We wound up with a lot of Amtrak action, but did catch some freight stuff here and there. 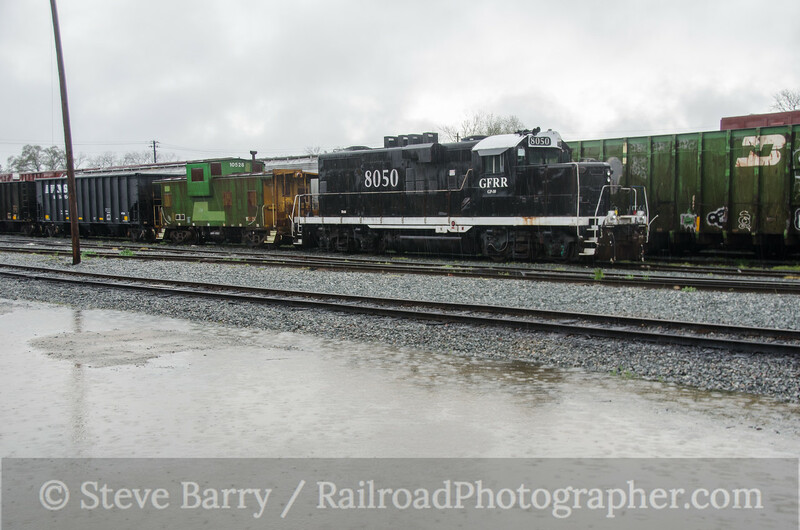 The weather in Florida was sunny, but as we moved north we were overcome by heavy rain (such as above on Norfolk Southern in Valdosta, Ga.). 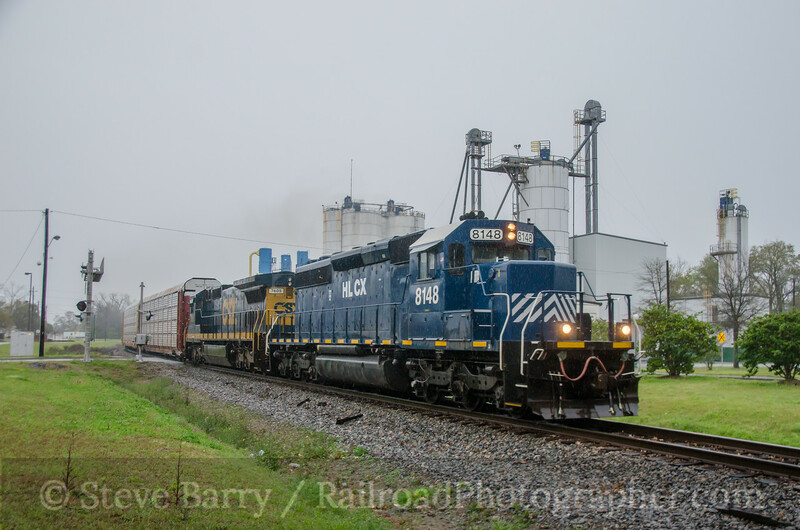 Here is some of the freight action we caught in between Amtrak encounters. Saturday, March 14, found not much moving on short lines. 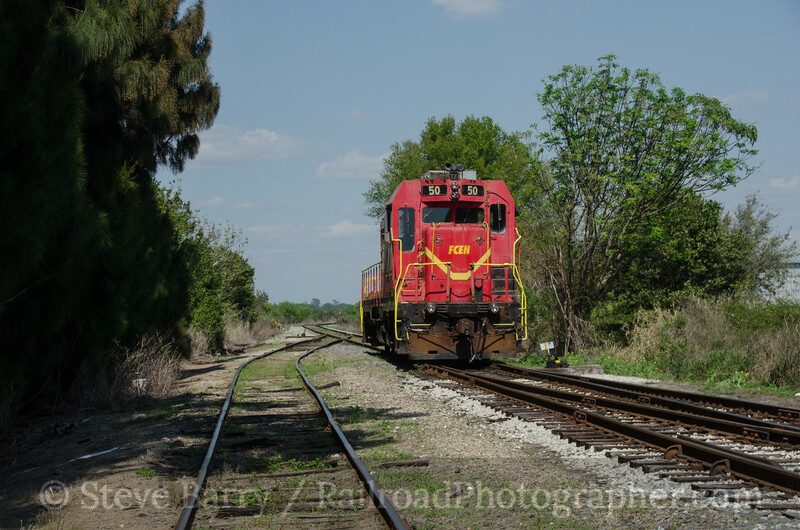 The Florida Central has several lines in the Orlando/Ocala area, and we found this lonely CF7 not far off of Amtrak's route through Lake Wales. We found another lonely Florida Central unit waiting out the weekend at Eagle Lake, not far from Winter Haven. The next day the sun was still shining and once again we were busy shooting Amtrak for the most part. 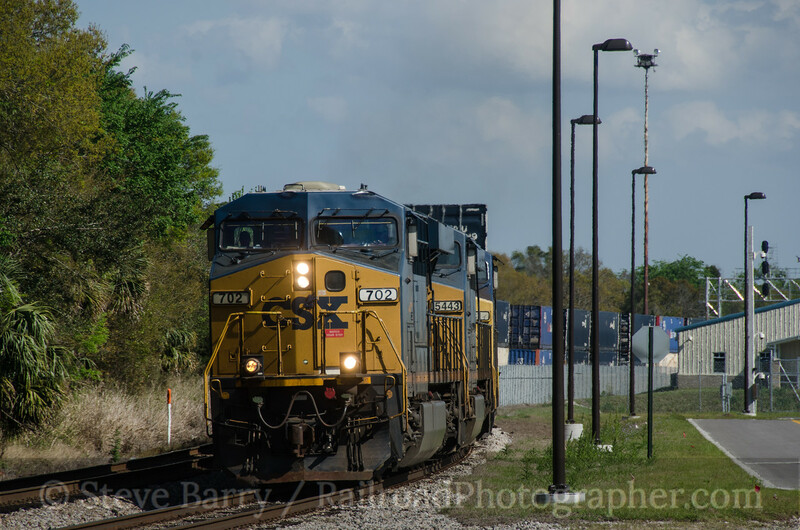 However, right around the time Auto Train was to head north from Sanford, a CSX freight made an appearance. Off to the right is the new shop complex for SunRail, which had still not started commuter service to Orlando at the time of this visit. A quick look at ATCS Monitor showed that Florida East Coast train No. 101 was still working its way southward from Jacksonville, so we zipped over to Titusville to intercept it. 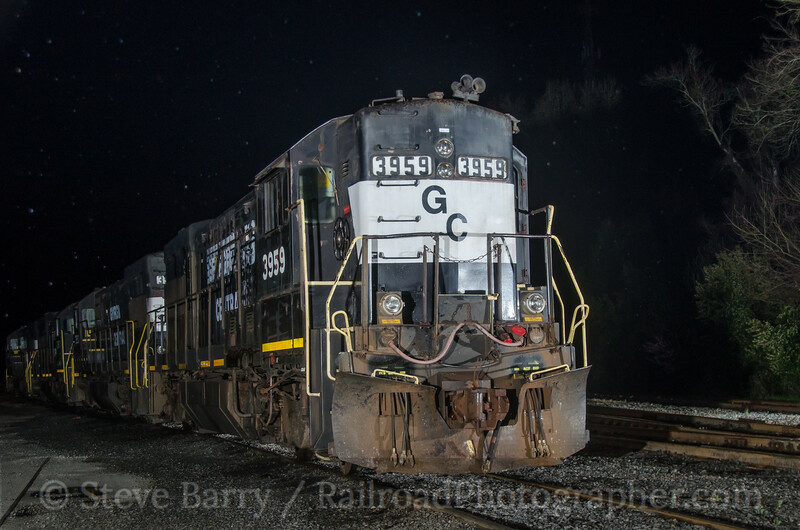 From there it was back over to the Sanford area to get a night shot I've always wanted. 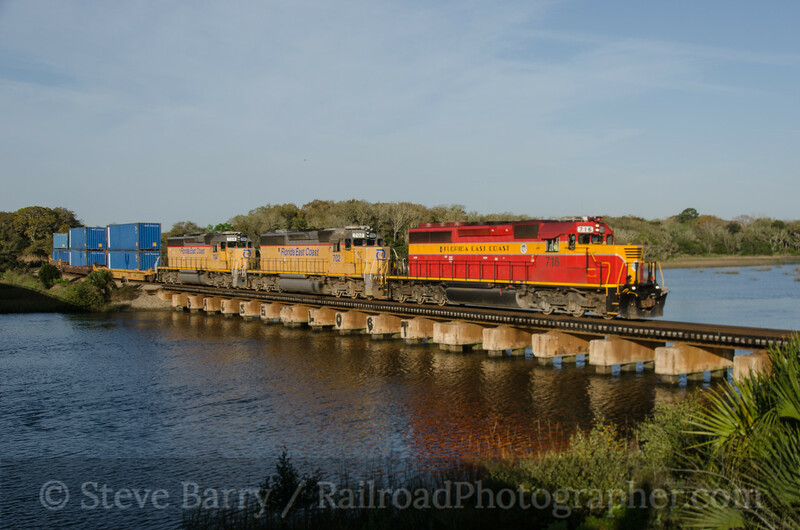 The goal was a southbound train crossing the St. John's River at Lake Morgan. At 10:26 that night, the goal was accomplished. 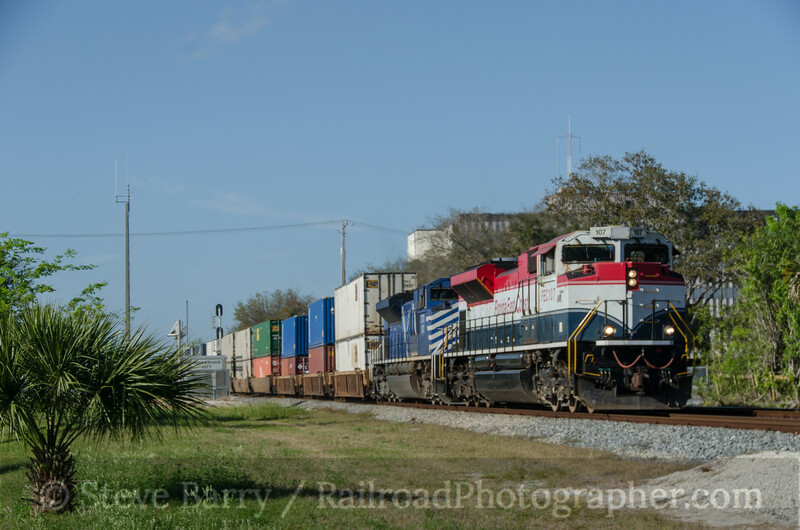 We didn't get as far north as we would have liked that night, but that put us in St. Augustine around daybreak, right around the time the Florida East Coast northbound rush gets in. 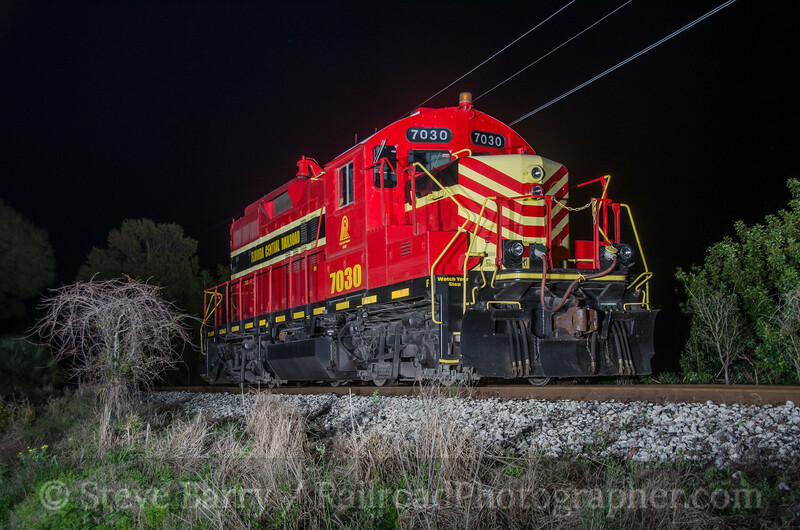 Being it was a Monday morning it wasn't much of a rush (intermodal trains don't load in Miami on Sunday night) but we got to the one place on the north end where FEC northbound trains are properly lit and were rewarded with one of the cool FEC heritage units on the point. From here we headed to Baldwin, Fla.; where CSX has a diamond complex that includes interchange tracks in all four quadrants. We were rewarded with a southbound train here. 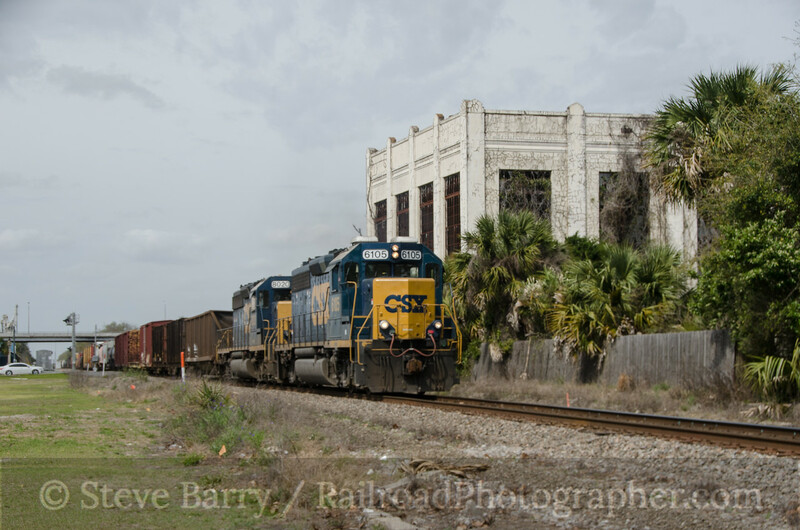 Continuing along CSX westward, our next stop was at Lake City, Fla. By now our sunny skies were showing signs of going away. 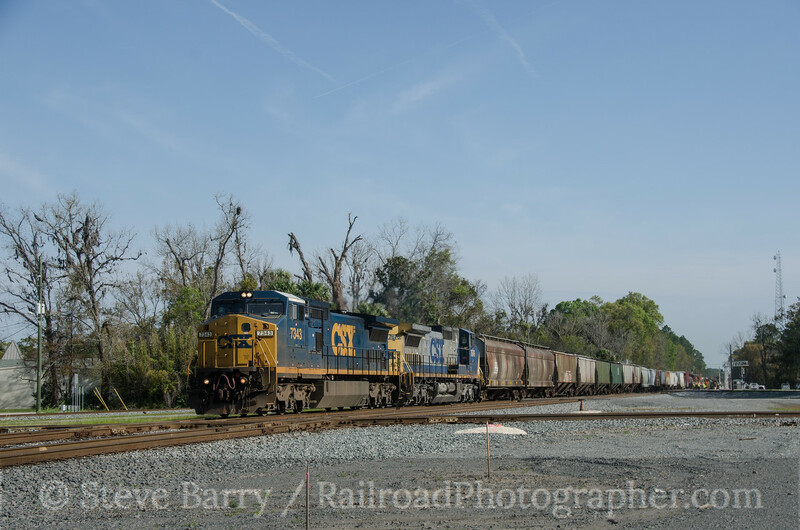 We caught an eastbound CSX train here. From here we turned north into Georgia and stopped at the Valdosta Railway outside of its namesake town in Clyattville. As can be seen from the logo, the Valdosta Railway is under the Genesee & Wyoming Industries umbrella. 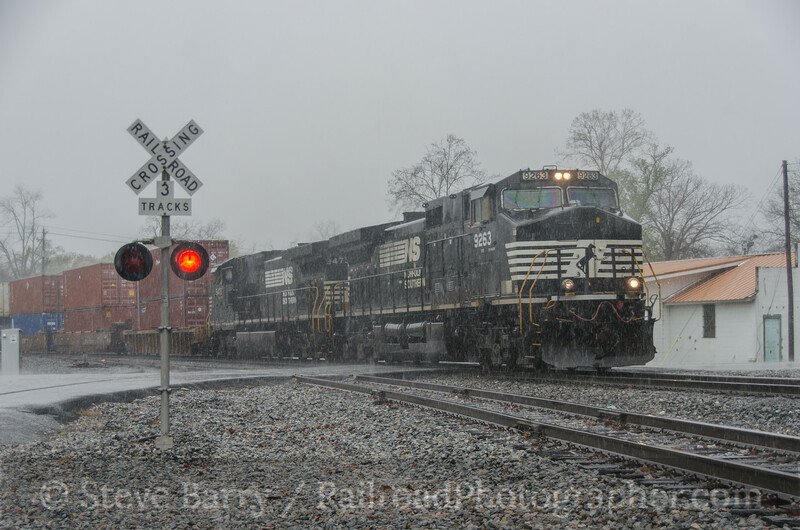 In Valdosta, the skies really opened up as we shot a Norfolk Southern freight (top of the post). 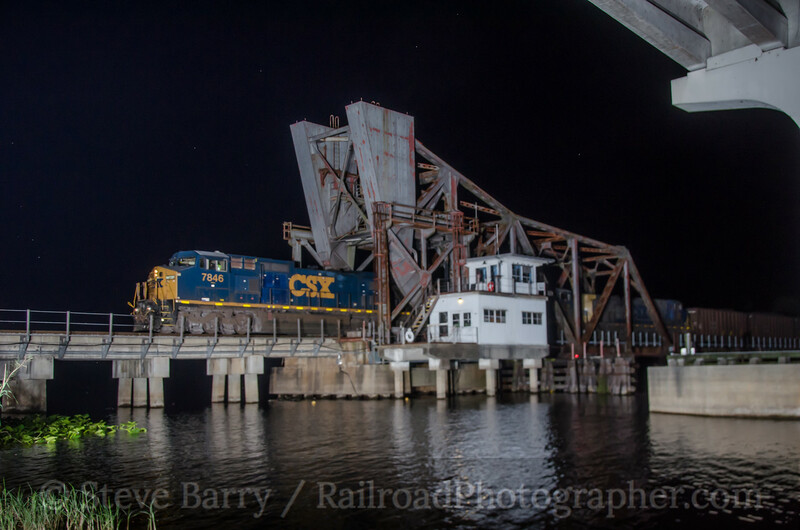 We heard horns for a CSX freight in town and took shelter under an overpass as we shot it. Hoping for sun and moving trains, we packed up and headed to Albany, hoping to see something interesting on the Georgia & Florida. Alas, we got neither sun nor moving trains. In fact, the rain continued to pour down in buckets. The rain finally let up as night began to settle in. 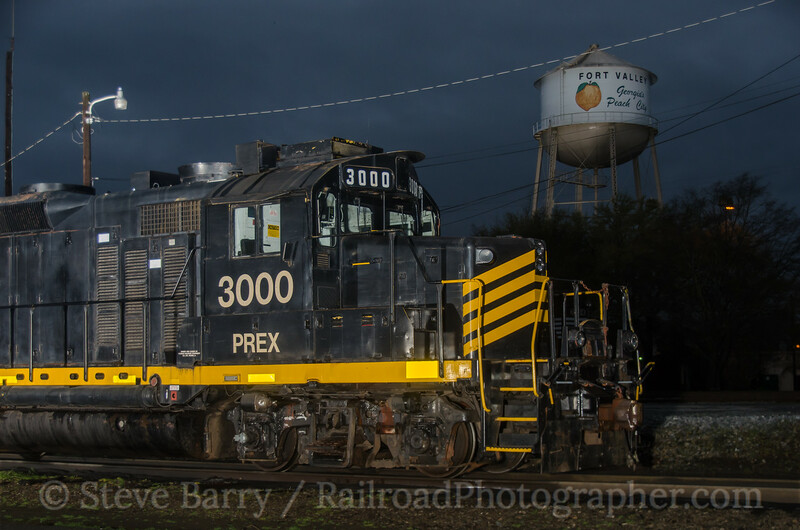 We stopped at Fort Valley ("Georgia's Peach City," according to the water tower) and got a few dusk shots of the Georgia Southern in town. The railroad is a subsidiary of Pioneer Railcorp. 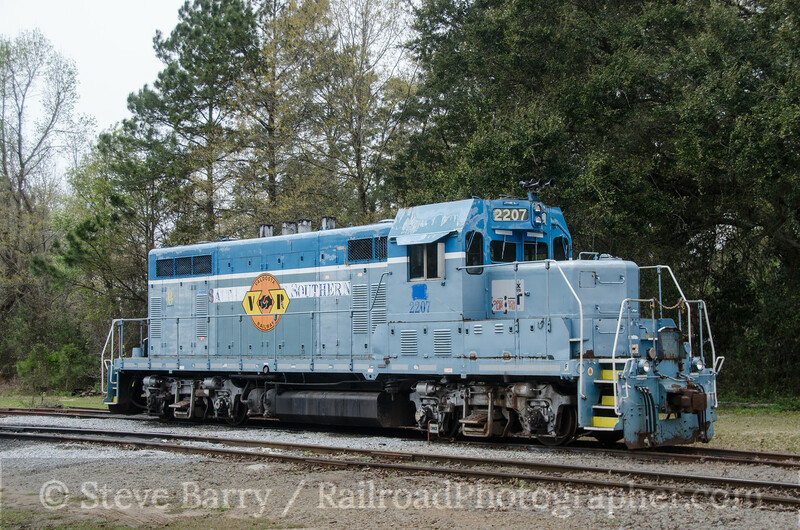 Our final stop would be at the Georgia Central in Macon, which operates an impressive fleet of U23B's. But that's another story for the not too distant future. A staple of the railroad excursion is the photo runby, where passengers are unloaded from the train (often at a scenic location), the train is backed up and then makes a furious run forwards past the passengers as cameras click away. No Class I railroad was better at the photo runby as Union Pacific. Operating in the wide open spaces of Colorado and Wyoming, there was plenty of room for 200 or more people to unload and get photos of the train with no other photographers in the shot. UP's trips over Sherman Hill between Cheyenne and Laramie, Wyo., were legen -- wait for it -- dary! 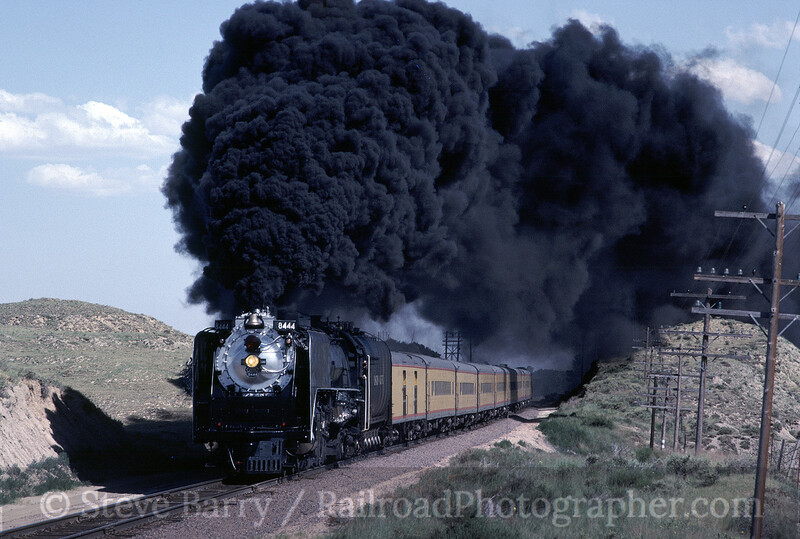 The 1982 convention of the National Railway Historical Society was held in Denver, Colo., and one trip operated during the event was a steam excursion from the Mile High City to Sterling. The trip was powered by UP 4-8-4 No. 8444 (originally numbered 844 and since returned to that number). The steam crew really knew how to put on the show; being an oil-burner, it was easy to get a black plume of smoke out of the stack for the benefit of the cameras. But perhaps no runby was quite as spectacular as the one at Narrows (above). This remains the largest plume of smoke I have ever seen come out of a locomotive during a photo runby. You can probably go back to Narrows now and still smell the oil in the air. There are still steam-powered rail excursions and there are still photo runbys, but nothing quite like this.